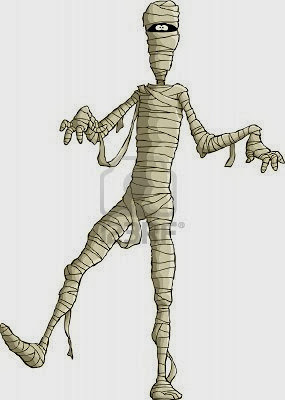 You know you are an obsessed quilter when you see a Mummy and instead of being frightened, you are wondering if those fabric strips are 2 1/2 inches wide....and just how long could they be? Long enough for a quilt binding? Last Saturday I went to my Machine Embroidery Guild (MEG) meeting for a wonderful presentation on machine embroidery greeting cards given by Ellen Snyder. I had a great time and loved Ellen's power point presentation...it was excellent! Another member, Carol, brought some hand made greeting cards from Germany that are thought to be from the 40's. I took several close ups in preparation for a blog post (wasn't expecting the title to be "The Adventures of Calamity Jane" that's for certain! I really enjoyed seeing these old cards and could certainly appreciate the time and effort put into making them. This was also my first visit to Quilt Heaven's new location. Wow, what a big beautiful store Lois has....if you live in the area, stop by and check it out. I took a few pix of the shop to share. Oh....I gotta tell ya it was also the last day of a sale, 25% off all fabric and an additional 5% if you finished the bolt. Yep....you know I did some shoppin'....and then some more shoppin'....... Taking my sack of fabric to the car and leaving to have lunch with my girlfriends from the MEG meeting... I was very happy. That happiness came to an abrupt end when I broke my ankle. Suffice to say since then, time has passed in a new way. I had 3 fractures and a dislocation which basically means I was in a world of hurt like I never knew possible. It was Wednesday before I could get my thoughts together and I still don't recall much of Saturday night through Tuesday. I was taken down for Physical Therapy on Wed. and when I returned to my room someone had cleaned it nicely. Yep...that's my quilt....I took it with me in the ambulance to help me feel safe when they took me back to Toledo Hospital Saturday night late. My quilt provided many opportunities for conversation and of course much warmth and beauty to an otherwise un-fun place to be. This is an inside view of my 7 days spent in and out of a narcotic haze. See all these arrow buttons? Do you think they all work? Nope! Try to figure out which ones work and which one's don't while on narcotic pain killers is a very tough task indeed. I pretended they were "needle up/ needle down" indicators and I was sewing...at least I was doing something I enjoyed...LOL. Someone has had a toileting accident in the hallway...no...they wouldn't be giving a description of there person would they? Oh don't tell me they are describing the the person as a brown person....I give up, I'll ask someone later. When I asked I was told a Code Brown is a missing person....a patient who is not in their room and should be. I was so relieved to know there were no potty in the hall...LOL. We've all heard that one...how long does a minute last? Typically it doesn't feel like a minute is a very long time but since this accident...I know know the entire length of 60 seconds VERY well. When 60 seconds is attached to another 159 of it's friends and the pain is so intense all I could do was pant....well....I can tell you I have an intimate awareness of the passage of a minute. There were several of those hours this past week and I never want to experience those again if at all possible. THEN there were "THOSE THREE MINUTES" yesterday when time came back in to the center of my conscious awareness. It was 12:58 on Saturday, October 19th and I had laser focus....what was I doing you may wonder? 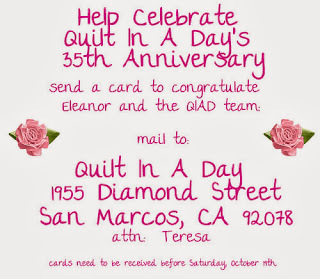 Trying to sign on to Quilt In A Day TV for the 1:00 (my time) airing of Lady Eleanor's 35 Anniversary Party. Congratulations Lady Eleanor....you sure are one very lovely role model inside and out! I say "role model" and I'm not referring as much to your amazing quilting career (you Quilt Hall A Famer you!!! :) as I am to the fine woman you are and the fun you bring to what ever it is you are doing. We need to make a beautiful red carpet just for you...a scepter and a throne too! Will someone get right on that as I'll be laid up for a while yet. Last evening I lost all track of time while looking at every piece of sale fabric at Quilt In A Day....don't miss their big sale...you'll be very sad if you do! Hello everyone, this is still Karin, posting on Kelly's behalf. Late this afternoon, Kelly was transported to the rehab facility in Perrysburg, where (we like to think) she's resting comfortably. Apparently, it wasn't all smooth sailing, but I don't have any details yet, so I don't really understand why, but she said her transition was "a comedy of errors." I trust we'll hear more about that later. In the meantime, I did want to share some photos with you...and, spoiler alert, they're pretty graphic. Just in time for Halloween, too. I'm going to recommend she post them up on her door when she gets home, just for fun! Nice, huh? I thought so too. It's no wonder she was in so much pain! I guess there will be no more MRI's in HER future! And won't airport security become FunFunCity? I'll post again, when I have more details to share with you all. 'till then, happy stitching! Hello again! Don't go gettin' all excited now...it's not Kelly posting yet...it's still Karin, her friend from down South. Just wanted to let you all know that Kelly is still in the hospital, but she's finally getting a little bit of pain relief. Of course, along with meds of that nature comes the horrible nightmares and insides of Jello, and the pain is still there, but it's beginning to be a little more tolerable, and for that, we're all thankful. I've actually talked to her on the phone a couple times today, and she's got her sense of humor back, that's for sure. She's aware of all your concern and prayers, and she greatly appreciates the comments, cards, flowers and kindness from you all. She's looking forward to moving to a rehab facility (possibly in the morning (Saturday)) that's only about 12 miles from her home, and much easier & more convenient for Mr. McSteamy and the co-workers to get to. I'll let you know as soon as that move comes about. And speaking of updates...did you know that Floriani Total Control and My Decorative Quilter have updates? Oh yeah, baby, oh yeah they do! That's one really cool feature about Floriani software - once you purchase it, you get updates for life. Free of charge updates for life. Not like some others, where you want the update, you've gotta fork over your firstborn or a whole lotta money...noooo, these are free. For life. So, how do you get them you ask?? All you've gotta do is connect your computer to the internet, however you normally do, then launch your Floriani product, and you can either wait for it to go check by itself (how smart is that?) or you can go up to the menu bar and click Help> Check for Updates, and then follow the on-screen prompts. It'll ask you to Agree to their licensing agreements, and then will want a few "Next" clicks and finally an "Install" click, and you're about done! It's really quite easy & painless. If you have any troubles, post your questions here & I'll try to answer them or get the answers for you. Not that I'm a Floriani expert, by any means, but I'm not afraid to go digging for information if I have to! I've not had time yet to check out all the new features & functionality, but I'm sure they'll be a lot of fun when I do get to 'em. Floriani is always looking for ways to automate the digitization process, and I know they listen to customer suggestions and feedback. Hello everyone, Karin here; I've hijacked Kelly's blog for now and you'll see why in a moment! She was out getting educated (and I'm sure also gathering tips & tricks to share right here) about what else, machine embroidery. And you know how hungry you get sewing, right? She's no different...after her guild meeting, a bunch of 'em went out to dinner at a local restaurant, and with considerable grace, our beloved Kelly flew through the air with the greatest of ease, just like the lady on the trapeze. Unfortunately, during that short flight, apparently, her foot stayed grounded inside a bunched-up rug. I know you can imagine what came next, and I'm also sure she'll fill you in on all the details as soon as she's up to it. What I can share with you tonight is "foot fractured in 3 places" and more pain than any one person ought to ever have to suffer. She's still currently hospitalized, after yesterday's surgery, and she has a nerve block attached (and finally turned ON) to help keep the pain down. With any luck, she'll be released in the next day or two. But, as you can imagine, orders placed over at IHAN will be slightly delayed. Kelly is grateful for all your kind thoughts and prayers and appreciates everything everyone's done to help her & her family through this challenge. She'll be back on both feet before long and will get those orders fulfilled just as quickly as possible. So, there ya have all the news that's fit to print. For now, anyway. On Kelly's behalf, hugs and smiles to you all! I measured the upper surface of my sewing machine an thought a 6 LED Light Strip would fit nicely there. It seems no matter how much light I have, I always want more when I'm sewing. Call it age...that's fine by me...but what ever it's called...I want more light. The 6 LED Light Strip I purchased for my machine is a "complete" LED Light Strip which means it has the electric cording and on/off switch. The LED Strips are available to put on other sewing machines and you only need to purchase the cord and switch the first time. I bought second 6 LED Light Strip for my embroidery machine. I like that these are thin so they don't get in my way. The strip comes with a peel off adhesive but I don't use those on my machine. I always put a 3M Command strip so I can take it off easily without ever leaving any residue. These little lights are nice and bright....just wait and I'll show ya. It looks like a landing strip for a very small air plane...LOL. Hopefully you can see the little command strip hanging out on the end. If ever I don't want the light on there I'll just pull the tab and off it will come. Another very nice feature is the on off switch. The LED Light Strips come in a variety of sizes. I think these are neat for long arm machines as well. You can see all of them HERE. 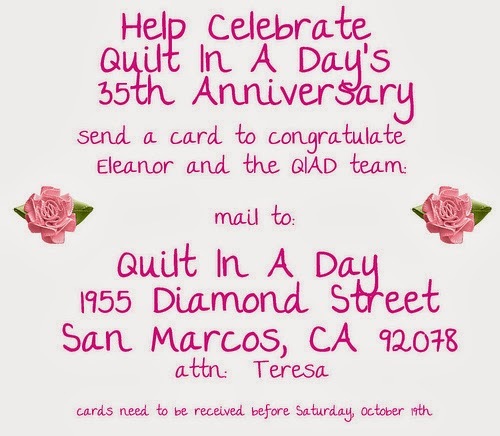 Lady Eleanor and the QIAD team are celebrating their 35th Anniversary!!!!! This is the first time I have ever seen Flamingos fishing....gives new meaning to "Gone Fishing" ay? Giggles! This is Diana's own design and the pattern for our class. The rose is beautiful and the quilting enhances this pillow so beautifully. Now, I'm not saying mine will finish looking like Diana's but I will say that she shared enough of her techniques and supplies that mine should be pretty darn nice. Using different shades of red on the rose and the buds accentuates the rose differently. Our supply list included a variety of red, pink and green fabrics. One gal brought several neatly cut squares of the variations of fabrics. What did I bring? A bag full of every red, pink and green I could find. What is up with me? I don't like deciding in advance if I'm not sure what I'm making so I bring everything and the kitchen sink too. LOL...and did I mention that I borrowed some red pieces of batiks from a girlfriend during class....oy vey! Here is my pillow so far. I used the practice piece that Diana provided to practice my machine applique stitching so I didn't mess up my "pretty" piece. 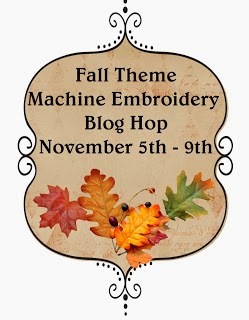 I have to say Diana not only did a good job of teaching us all that she knew about perfecting the stitching but also provided us with some of her favorite machine applique supplies including Soft Fuse and Pellon Stabilizer. We received printed instructions so we could finish the project at home....including a hand drawn pattern on freezer paper with the quilting design too!!! If I were to teach a class like this and do all that she had done to prepare, you bet our bottom I'd be charging over a hundred bucks...LOL. I came home and finished these pillowcases for my sister. She is studying for a big exam and I thought I'd give her something to smile about before the big test. I hope all of you had a wonderful weekend. If you've taken any classes recently I'd love to hear about your experience too. If you've blogged about it, just leave a link in your comment and I'll hop over and read all about it. Yep...I only used my HP laptop to do my blogging and now I'm paying the price. I feel like I'm blogging with new glasses even though all I'm doing is using a Mac Book. A bit different...yes...and...I can do this! So, what have I been up to you ask? I've been working on this quilt for my mother's doctor. I know he'll be very surprised when I mail it to him. The fabric is a Parson Gray (I love this line) and the pattern is Perfect Ten by Swirly Girls Design. I still have a border to put on but that will be done by the end of the week....my fingers are crossed. That's right, I didn't have flip the power toggle on the lower right. But how then could I be sewing and sewing and sewing? Apparently my Featherweight works when plugged in and the toggle switch only turns on the light. Does yours do that? Ya learn something new every day.....at least I do! Oh yes....and then there is my youngest co-worker. Mr. McSteamy and I have spent so much time helping Zach adjust to 4th grade. He is really struggling and he is an A student. I can't imagine how difficult this must be to adjust...I can't imagine it because I can't remember that long ago. One very good reason not to have a child at 40...LOL. You've heard the joke about the woman who had a baby at 65? A visitor arrives and wants to see the new baby and she has to wait for it to start crying because she forgot where she put it....not so far from reality....giggles. While I'm trying to find the rest of my photos from iphoto and picassa....still working out the Mac Book thing here....I want to share a beautiful quilt I saw in the ladies room at a church. I fell in love with this quilt and it gave me a great idea for using vintage hankies. Such a great way to show the beautiful hankies. I've run across some that had stains and the corners could be used so don't throw them away...if you don't want them...send them my way! The Heart Zipper blog is giving away this bundle of Northcott Magical Dragons Fabrics...be sure to stop over and leave your name.